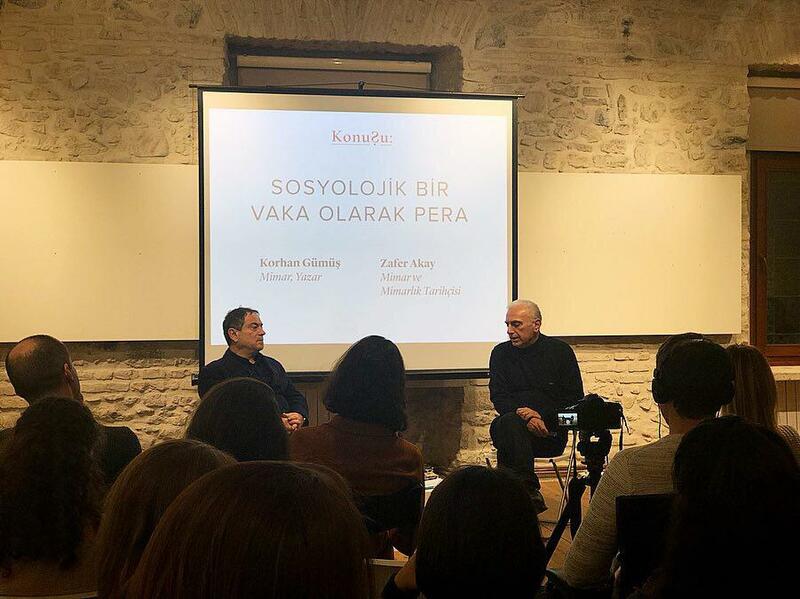 Architect Korhan Gümüş, who is conducting large scale projects to protect the architecture of Pera since 1980, and Architectural Historian Zafer Akay, also lecturer at the Bilgi University, talked about how the architecture of Pera must be evaluated from the point of sociology, its place in social memory, “critical” points in its history and changes during neoliberal politics. Since the Byzantine and Ottoman period Pera, a 2000-year-old settlement, has always been subject to changes due to the political and economy shifts of the time and has been used as a trade centre opposite the city centre. The region where Armenian, Greek and Levantine minorities lived developed different architectural characteristics where different cultures met. Pera, which was forced to change its identity after the great fire in the 19th century after a long period of being known as the Ottoman’s financial centre, was examined by the speakers at The Circle from a point sociological perspective.